I am a total 80's child! So it really is no surprise that when it comes to wearing neon colors, I am all over them. 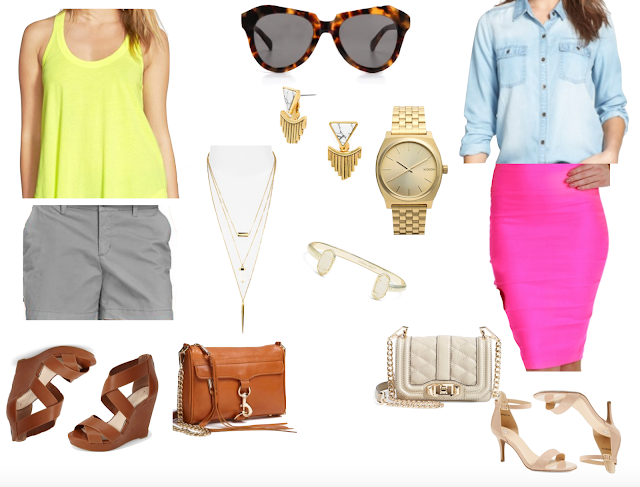 Summertime is the perfect opportunity to wear all the bright colors. However, lately I have enjoyed mixing them with neutrals to help tone them down while still looking chic. You can click on each of the photos below, for the direct link to each item. Here are some more neon options. If you feel a little nervous to rock a bright color then choose a bright earring or the pink striped neon clutch to add a little pop to your outfit. I love that neon pink skirt! The jean shirt would look perfect with it!